Annual real gross domestic product by industry — N.L. Annual real gross domestic product by industry — P.E.I. Annual real gross domestic product by industry — N.S. Annual real gross domestic product by industry — N.B. Annual real gross domestic product by industry — Que. Annual real gross domestic product by industry — Ont. Annual real gross domestic product by industry — Man. Annual real gross domestic product by industry — Sask. Annual real gross domestic product by industry — Alta. Annual real gross domestic product by industry — B.C. Annual real gross domestic product by industry — Y.T. Annual real gross domestic product by industry — N.W.T. Annual real gross domestic product by industry — Nvt. Real gross domestic product (GDP) by industry increased in seven provinces and the Northwest Territories in 2015. GDP declined in Alberta, Newfoundland and Labrador, Saskatchewan, Yukon and Nunavut, largely because of the impact of lower oil and metal prices. Nationally, real GDP by industry rose 0.9% in 2015. British Columbia led the provinces with GDP growth at 3.0%. 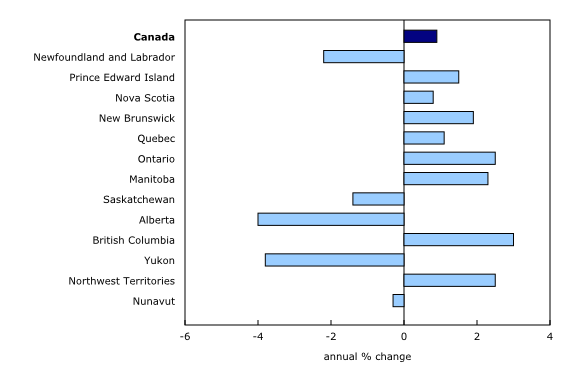 The largest decline in GDP among the provinces was in Alberta (-4.0%). In Newfoundland and Labrador, GDP fell 2.2% in 2015, following a decline of 2.3% in 2014. Goods output decreased 6.1%, led by a significant decline in conventional oil and gas extraction. Lower oil prices contributed to a sharp decline in oil and gas engineering construction and in support activities for oil and gas extraction. Copper, nickel, lead and zinc ore mining also declined. In contrast, iron ore mining rose significantly, partly as a result of increased output capacity and a recovery from weather-related production difficulties in 2014. Construction decreased 7.3%, as residential building, non-residential building and engineering construction declined. However, electric power engineering construction rose, as work on a major project continued. Electric power generation, transmission and distribution grew. Manufacturing increased 5.1%, led by a rebound in petroleum refineries, higher output from a new non-ferrous metal smelter, and, to a lesser extent, an increase in seafood product preparation and packaging. Services-producing industries advanced 1.3%, as increases in public administration, finance and insurance services, and retail trade more than offset decreases in information and cultural industries and professional, scientific and technical services. In Prince Edward Island, GDP rose 1.5% in 2015, following similar growth in 2014. Construction was up 2.5%, as an increase in engineering work on bridges and highways was partly offset by a decline in non-residential building construction. Residential construction increased 4.0%. Fishing, hunting and trapping rose 5.1%, reflecting a good lobster season. However, dry growing conditions resulted in a 1.6% decrease in crop production. Manufacturing grew 0.9%, as gains in pharmaceuticals and medicines and industrial machinery were largely offset by a decline in food products that resulted from a major plant closure. Services output advanced 1.4%. Both retail and wholesale trade contributed to the growth. A strong home resale market contributed to higher output of offices of real estate agents and brokers and insurance carriers. Lessors of real estate also increased. Tourism-related industries also contributed to growth, as a result of a record season aided by the Canadian dollar's lower value. Nova Scotia's GDP rose 0.8% in 2015, following a 0.7% increase in 2014. Manufacturing increased 3.7%, led by ship and boat building, as the new Arctic Offshore Patrol Project advanced. Seafood product preparation also grew, while output of pharmaceuticals and medicines fell. Fishing, hunting and trapping increased 5.6%. Animal production increased 20%, with gains in aquaculture and fur farming. Construction fell 2.6%, largely as a result of a 30% decline in engineering construction, as electric power and oil and gas engineering activities dropped significantly. However, non-residential building construction advanced 8.8%, partly because of ongoing work at a new hotel and convention centre. Residential construction rose 4.8% on strong growth in apartment buildings. Output in the energy sector decreased 9.0%. A significant drop in natural gas extraction due to production difficulties more than offset a large increase in oil and gas exploration activity. Pipeline transportation also contributed to the decline. Services industries were up 0.9%, as higher output in retail trade, provincial public administration, banking services, transportation services and wholesale trade was partly offset by declines in federal public administration and defence services and administrative and support services. In New Brunswick, GDP rose 1.9% in 2015, the best pace of growth since 2010. This followed a 0.3% decline in 2014. Goods-producing industries grew 4.6%, while services output increased 1.0%. Manufacturing rose 4.3%, led by a rebound in refined petroleum products following maintenance work in 2014. Higher export demand contributed to strong growth in wood products, primary metals, paper products and food products. Mining and quarrying increased with the reopening of a metal ore mine and higher potash mining. Construction rose 2.3%, largely because of a major oil and gas engineering project, while non-residential building construction declined. Residential construction edged down 0.5%. Forestry and logging increased 9.0% on strong growth in exports. Crop production grew 10%, the result of a good blueberry crop and higher potato production. Aquaculture increased, largely as a result of higher output from salmon farms. In the services sector, gains in retail and wholesale trade, banking services, food and drinking services, and computer systems design and related services were partly offset by declines in provincial public administration, administrative and support services, and information and cultural industries. Quebec's GDP grew 1.1% in 2015, after a 1.4% increase in 2014. Services-producing industries increased 1.3%, with higher output from banking services, computer systems design and related services, lessors of real estate, financial investment services, and transportation services. Provincial public administrative services fell 3.0%. Administrative and support services and architectural, engineering and related services also declined. Goods-producing industries increased 0.6%. Metal ore mining posted double-digit growth for the third consecutive year, rising 10% in 2015. Gold and silver mining increased 24%. Copper, nickel, lead and zinc mining was also up. However, support activities for mining, which include mineral exploration, decreased significantly on weaker metal prices. Construction declined 2.4%, as a number of large non-residential building and electric power engineering projects were completed. Residential construction decreased 1.4%. Manufacturing output was up 1.0%. Increases in manufacturing of pharmaceuticals and medicines, wood and paper products, miscellaneous products, and machinery were partly offset by decreases in aerospace products and parts, electrical equipment and appliances, and computer and electronic products. In Ontario, GDP rose 2.5% in 2015, more than twice the national pace of growth. The province's GDP also grew 2.5% in 2014. Services industries grew 2.8%, while goods industries increased 1.8%. Services-producing industries showed broad-based gains, notably in banking services, computer systems design and related services, financial investment services, lessors of real estate, offices of real estate agents and brokers, and wholesale and retail trade. Arts, entertainment and recreation industries increased as a result of a number of major sporting events. Residential construction grew 7.8% as a result of strong demand. Engineering construction advanced 7.5%, the result of ongoing public transportation and pipeline projects. Non-residential building activity declined 1.0%. Manufacturing increased 1.5%, as 13 of 19 major industry subsectors advanced. Gains were made in pharmaceuticals and medicines, plastic products, computers and peripheral equipment, miscellaneous products, and paper and wood products. In contrast, decreases were reported in printing and related support services, iron and steel mills, steel products, and aerospace products. Motor vehicle manufacturing decreased 1.9% as a result of re-tooling operations by several motor vehicle manufacturers. However, motor vehicle parts manufacturing increased 3.4%, as exports to the United States increased. Lower metal ore prices led to declines in support activities for mining as well as in metal ore mining. Electric power generation, transmission and distribution decreased 1.9%. Manitoba's GDP increased 2.3% in 2015, following growth of 2.0% in 2014. Construction grew 9.6%, led by engineering work on major electric power and transportation projects. Lower oil prices contributed to a large drop in oil and gas engineering construction. Non-residential building construction rose 5.8%, while residential construction declined 6.8% as builders reduced inventory. Crop production grew 15% with yields at near-record levels for most crops. Animal production declined 4.8%. Electric power generation, transmission and distribution increased 2.9%. Manufacturing decreased 1.9%, as gains in chemicals, aerospace products and parts, furniture, and printing and related support services were more than offset by declines in agricultural, construction and mining machinery, meat products, and fabricated and primary metal products. Mining, quarrying and oil and gas extraction fell 2.2%, as both conventional oil and gas extraction, and copper, nickel, lead and zinc mining declined. Services output rose 2.0%, with increases in lessors of real estate, banking services, provincial public administration, transportation services, insurance carriers, and retail and wholesale trade. In Saskatchewan, GDP declined 1.4% in 2015, after a 1.6% increase in 2014. Construction fell 19%. Lower oil prices led to a significant drop in oil and gas engineering construction, while other engineering construction declined as new mining capacity came on stream. Residential construction declined 15% on weaker demand for housing, and non-residential building construction decreased 2.6%. Support activities for oil and gas extraction also fell significantly. Output of oil and gas extraction decreased. In contrast, mining and quarrying increased 13% with significant gains in potash mining and other metal ore mining (uranium). Despite dry growing conditions, crop production grew 1.7%. However, drought conditions led to a decline of 19% in animal production due to difficulties with feed and water supplies. Manufacturing output decreased 2.8%, as losses in machinery, primary and fabricated metal products, transportation equipment, and chemicals were partly offset by gains in refined petroleum products, food products and wood products. Services output advanced 0.8%, with increases in lessors of real estate, banking services, health care, and local, municipal and regional public administration, as well as in education services. Professional, scientific and technical services and publishing industries declined. Lower economic activity contributed to decreases in wholesale and retail trade and truck transportation. Crude oil pipeline transportation rose 7.1% as inventories were reduced. In Alberta, GDP decreased 4.0% in 2015, after growing 4.5% in 2014. Goods-producing industries fell 8.3%, while services-producing industries edged down 0.5%. Lower oil prices led to a 38% decline in support activities for oil and gas extraction and a 34% decrease in oil and gas engineering construction. Together, they accounted for most of the decline in GDP. However, non-conventional oil and gas extraction increased, as large oil sands projects increased output. Crude oil pipeline transportation also advanced. Dry conditions contributed to a 3.6% decline in crop production and to a 9.0% drop in animal production. Manufacturing decreased 6.9%, as 13 of 19 major industry groups fell. Machinery, fabricated metals, petroleum refineries, wood products, primary metals and plastic products contributed the most to the decline. Residential construction fell 2.2%. Lower goods production led to decreases in truck and rail transportation. Services output decreased 0.5%. Both wholesale and retail trade fell for the first time since 2009. Losses in professional, scientific and technical services, offices of real estate agents and brokers, and accommodation services related to the housing of construction workers offset gains in lessors of real estate, banking services, health care, and local, municipal and regional public administration. In British Columbia, GDP rose 3.0% in 2015, following growth of 2.9% in 2014. Services-producing industries increased 3.8%, while goods-producing industries edged up 0.5%. Strength in the real estate market led to higher output of residential and non-residential building construction and contributed to gains in offices of real estate agents and brokers, lessors of real estate, and banking services. Retail trade advanced 6.3% on gains across all store types. Tourism related industries, such as accommodation and food services and arts, entertainment and recreation, advanced. Financial investment services, transportation services, and computer systems design and related services all contributed to growth. Output of elementary and secondary schools grew 13%, after falling 10% in 2014 because of a labour dispute. Mining, quarrying and oil and gas extraction declined 7.8%. Falling export demand resulted in significant losses in the mining of coal and molybdenum used in steel production. Lower commodity prices led to a notable decrease in support activities for mining and oil and gas extraction. In contrast, natural gas extraction rose 4.0% and copper, nickel, lead and zinc mining increased 4.0%. Engineering construction dropped 11% as a result of large declines in oil and gas engineering and other engineering construction, as new projects were scaled back or delayed and a major smelter modernization project was completed. Forestry and logging increased 4.8% on higher exports. Manufacturing advanced 2.5%, as gains in food and beverage products, wood products, chemicals, and furniture were partly offset by losses in fabricated metals, transportation equipment and electrical equipment. In Yukon, GDP decreased 3.8% in 2015, following a decline of 0.8% in 2014. Goods-producing industries fell 21%. Lower metal ore prices and the temporary shutdown of a mine led to a sharp decline in copper, nickel, lead and zinc ore mining. Gold and silver ore mining decreased notably. Support activities for mining also fell significantly. Engineering construction decreased across all industry subsectors. Non-residential building construction increased with higher spending on public infrastructure and health care facilities. Residential construction grew 7.0%. Services-producing industries grew 1.5%, led by retail trade, professional, scientific and technical services, territorial public administration, and education services. Accommodation and food services and wholesale trade declined. In the Northwest Territories, GDP increased 2.5% in 2015 after growing 5.9% in 2014. Engineering construction advanced 28% and accounted for most of the growth, as work at new and existing diamond mines continued. Residential construction rose 11% with new public housing projects underway. Air, water and truck transportation industries grew. Non-residential building construction fell. Diamond mining declined 1.7%. Other metal ore mining declined significantly, as a result of a mine closure. Oil and gas extraction increased 1.1%. Federal public administration and defence, and local, municipal, regional and aboriginal public administration contributed to growth. In Nunavut, GDP edged down 0.3% in 2015, following growth of 3.6% in 2014. Construction declined 8.5%, as both residential and non-residential building activities fell significantly. Mining, quarrying, and oil and gas extraction declined 2.3%, as a drop in gold and silver mining offset an increase in iron ore mining. Support activities for mining increased significantly as a result of higher exploration activity. Services output rose 2.3%, with higher output in public administration (including defence), retail and wholesale trade, transportation and warehousing, real estate, rental and leasing, and educational services. The provincial and territorial gross domestic product (GDP) by industry data at basic prices are chained volume estimates with 2007 as their reference year. This means data for each industry and aggregate are obtained from a chained volume index multiplied by the industry's value added in 2007. Percentage changes for GDP by industry are calculated using volume measures, that is, adjusted for price variations. Estimates of provincial and territorial GDP by industry for 2015 are included with this release. No revisions have been made to data for previous years. Revised estimates of provincial–territorial GDP by industry, and by income and expenditure for 2013 to 2015 will be published in November. To enquire about the concepts, methods or data quality of this release, contact Guillaume Dubé (613-863-0782; guillaume.dube2@canada.ca), Industry Accounts Division.